Fordin' - Cars! Cars! Cars! Man, lots of Ford goodness today! Apparently part of Ford's Road Ahead/Move Forward/New Slogan Here is to ask for a handout (which seems about right to us... why build a lot of cars we all want to buy in order to make money?). Autoblog reports: Ford asks government for help to modernize U.S. plants. Pitching Ford Motor's "Way Forward" program to the U.S. Chamber of Commerce "Competitiveness Forum" Wednesday, Ford's president of the Americas Mark Fields asked the federal government for a variety of support to "level the playing field" for domestic automakers in the U.S. market, including incentives for upgrading out-of-date factories. According to the paper, those documents outlined a proposal for Ford to invest $9.2 billion in Mexico over the next six years, building plants, expanding existing facilities and increasing purchases of Mexican-made components 300 percent. It suggested Ford's investments could bring 150,000 jobs to Mexico over the next decade. In his speech to the U.S. Chamber of Commerce in Washington, D.C., Fields urged support for the domestic auto industry and said foreign automakers are overselling their made-in-America credentials. "Despite all their claims about being 'American,' most of the cars and trucks the foreign automakers sell in America aren't actually made in America," he said. Nor are all Ford vehicles. The automaker already has three plants in Mexico, including one in Hermosillo that produces its new Fusion, Mercury Milan and Lincoln Zephyr sedans. What we don't understand is the hub-bub: So what if the car isn't American-made? Nothing in our homes is, anymore. We thought this was a capitalist society where "the market" is supposed to balance things out so that the consumer wins. Canning American workers, moving a plant to Mexico while wrapping the flag around a company is pretty lame and strikes us as trying to have it both ways (pro-capitalism yet nationalist). *We learned to spell disingenuous without a spell checker! The way I see it is that Ford has 2 ways of being profitable, and they can happen separately or together. They can lower production costs so that they make a larger per-unit profit, or they can actually make better products. 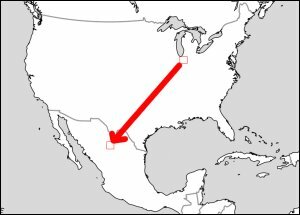 Obviously, this move to Mexico is to get a larger per-unit profit. Now, if they only use that money wisely (read: Put more into R&D and make better products). If they don't, the profit will be short term and they will continue to lose market share and ultimately lose big. As for being American cars...I don't think there will be any American car companies if they don't utilize the benefits of low labor costs found in Mexico. Business economics dictate that when something can be done cheaper elsewhere, it's better to have it done there. Otherwise you're just putting yourself at a competitive disadvantage, cause your competition will be making them cheaper there, too.